Researchers have detected morbillivirus in the bodies of dolphins that died off the Atlantic shores of the U.S. They conclude that there’s an epizootic affecting the younger dolphins that have never been exposed to that virus. Here’s more about the epizootic and other dolphin die-offs from previous years. Morbillivirus is in the same viral genus as the viruses for measles and rinderpest. In 2001, J.G.M. Thewissen and Sunil Baptai summarized the various whale fossils that during the 1990s took whale evolution from a mystery to a well understood evolutionary process. See “Whale Origins as a poster child for macroevolution” (PDF). Especially exciting was when they pointed out, “Some hundreds of individuals are known” and when they explained how isotopes of oxygen can tell us whether bones were formed by marine or fresh-water organisms. National Geographic Magazine has published images and brief descriptions of seven transitional fossils discovered since Charles Darwin published his theory of evolution. Each of them is another big piece of evidence confirming the explanation of how life’s diversity came developed. Artist Carl Buell has a lovely picture of the Ambulocetans natans, a progenitor of the whale, which is updated with the latest scientific information. You can see it on his photostream on flickr. Update: The Flickr photo is offline, so here is a similar image from National Geographic: The Walking Whale. Here’s an image by Carl Buell from the University of New Zealand’s marine mammals wesbsite: Artist’s impression of Ambulocetans natans, courtesy of Carl Buell. Here’s a different image by Carl Buell, from an evolution website. 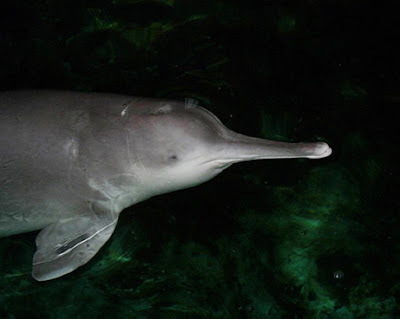 The Yangtze River Dolphin, a unique species of freshwater dolphin, has been on the most endangered list for some time. China’s industrial development, with pollution and habitat destruction, combined with illegal fishing, have driven it over the edge. An intensive survey found not one left. It’s possible that one or two still lurk in the murky waters, but for practical purposes, they are gone. They have been declared extinct and by humans, the first large mammal to be lost that way in fifty years. Working with DNA from dolphins in Shark Bay–1 male sponger, 12 female spongers, and 172 nonspongers–the researchers found that all but 1 of the spongers shared markers in the DNA of their mitochondria, cellular organelles inherited exclusively from mothers. Despite examining 10 scenarios of inheritance, both for mitochondrial DNA and DNA from cell nuclei, the researchers were unable to explain genetically the observed female-biased pattern of sponge carrying.